\"Der Schrannenplatz in München\". Blick über das geschäftige Treiben auf dem Marienplatz Richtung Osten zum alten Rathaus, rechts im Hintergrund der alte Peter. 1839. First Edition . SWARBRECK, Samuel Dukinfield. Sketches in Scotland. 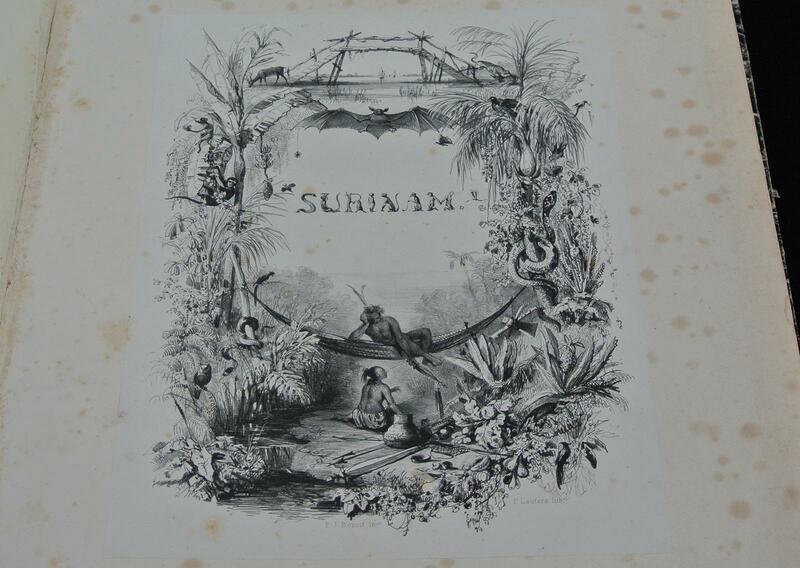 London: Printed at C. Hullmandel and Published by the Author, 1839. Elephant folio (15 by 21 inches), original half black morocco. 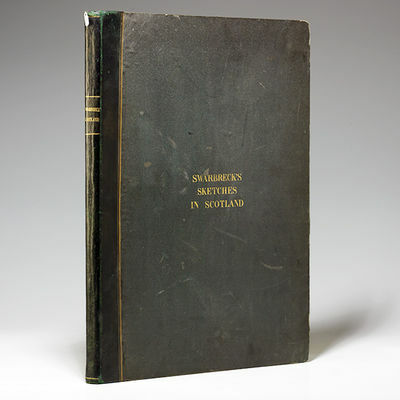 $4500.First edition, with tinted lithograph title page and 24 lovely large tinted lithographs of views, street scenes and antiquities of Scotland, mostly in Edinburgh and the lowlands, after sketches made by Swarbreck during his 1837 tour.Printer and lithographer Charles Joseph Hullmandel pioneered the use of the then-new process of lithography in England. ""Among the many artists who availed themselves of his processes for the reproduction of their drawings were Stanfield, David Roberts, Haghe, Nash, and Cattermole"" (DNB). The lithographs he made from Swarbreck's sketches show his masterly use of gradations of tones and highlights that give the appearance of soft watercolor washes so suited to landscape painting. Abbey, Scenery 492. Very faint marginal dampstaining and only slight pinpoint spotting to lovely plates, light wear and soiling to binding. An exceptionally good copy. Scarce. London: Taylor / Taylor & Francis, 1839. 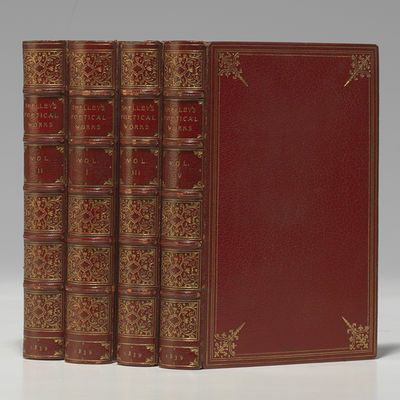 First edition, 8vo, 3 volumes, 17 engraved plates, a number folding; bookseller's ticket of Charles Haselden in volume I, bookplates of James S. Drury, M.B. in volumes I and II; rear hinge cracked on volume II, rear hinge cracked and rep[aired in volume III; binding of volume I slightly dull, else a very good set in original blindstamped green cloth and scarce thus. Each volume contained in a separate quarter black morocco clamshell box. Laid in is a 1933 invoice for the set from Henry Sotheran (for £5.79). The first publication of all of Faraday's important research in book form, work available earlier only in short papers and articles in the scientific periodicals of the day. Present here are epochal papers on electric induction ("Faradic current"), the principles of the dynamo, electronic state of matter, equivalents of electro-chemical decomposition, and magnetism. In addition there are prescient papers dealing with experiments on the actions of a magnetic field on polarized light and the general field studies that laid the basis for Maxwell's research later in the century. This is a difficult book to come by in first edition form, given its appearance over a 15-year period. A worthy copy of one of the great scientific books of all time. Horblit 100, no. 29; Gartrell, no. 708; Norman 762. 2 Bll. Violetter Samt d. Zt. mit dezenter Linienvergoldung und Bindebändern. 36 x 26 cm. Oteanu (1839-1877), 1863 zum Priester geweiht, war seit 1870 Bischof von Lugoj, dann 1873 von Nagyvarad. Er starb mit nur 38 Jahren an Leberzirrhose und wurde in der St. Nikolaus-Kathedrale im heutigen Oradea begraben. Der ebenfalls unterschreibende Trefort war seit 1872 ungarischer Minister für Religion und Bildungswesen. - Innen wenig braunfleckig, Trennblätter etwas lädiert, sonst gut. NARRATIVE OF A JOURNEY ACROSS THE ROCKY MOUNTAINS, to the Columbia River, and a Visit to the Sandwich Islands, Chili, &c. with a Scientific Appendix. Philadelphia: Henry Perkins, 1839. 352 pages of text. Original green cloth binding with minor rubbing and shelfwear; protected in archival mylar. Several tiny areas on the binding have been touched up. The text is clean and unmarked. First edition. 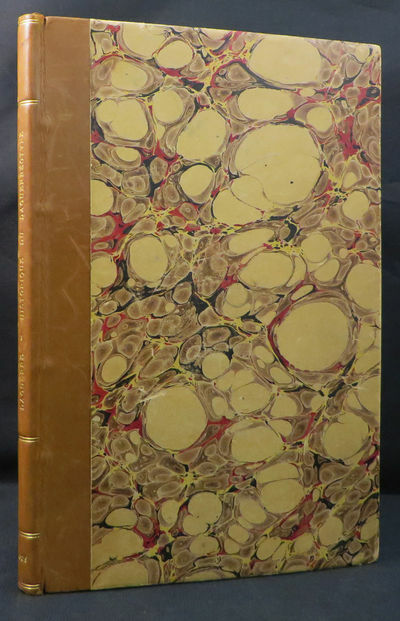 Howes T319; Graff 4173; Wagner-Camp 79; Field 1558; Sabin 96381.. First Edition. Hardcover. Very good+ condition. Octavo (8vo). Voyage a Surinam: Description des Possessions Neerlandais dans la Guyane. Map dimensions 60 x 88 cm, overall 65 x 90 cm. Folding map of central and western Europe, extending from Hungary in the east through Germany and France to England and Wales in the west, original delicate handcolouring denoting the geological strata with a corresponding key to the lower margin, dissected into 36 sections and mounted on linen, folds between contemporary diced cloth boards with original working metal clasp, recently rebacked in a leather of a similar colour. Wear to a few folds, some general superficial soiling to the paper, very good overall.A handsome geological map compiled from some of the leading geologists of the day. First edition. Two parts in one volume. 4to. xxxii, 576; (575-59), 580-768 pp. Contemporary tan full calf, spine with raised bands, twin gilt lettered maroon labels, armorial bookplate to the front pastedown. 14 "lithographic sketches" - 12 full page and 2 folding of which 3 are coloured and another is tinted, plus 112 woodcuts in the text, 3 maps on 2 sheets, 31 plates of fossils (including 4 bis plates) and 9 coloured folding sections. Not including the large folding geological map on three sheets, included in the plate list but issued under separate cover and often wanting. Repair to the lower joint, some wear to the boards, occasional foxing to the plates, else very good. 1839. First Edition . SHELLEY, Percy Bysshe. The Poetical Works. Edited by Mrs. Shelley. London: Edward Moxon, 1839. Four volumes. 12mo, original blind- and gilt-stamped red cloth, uncut and partially unopened. 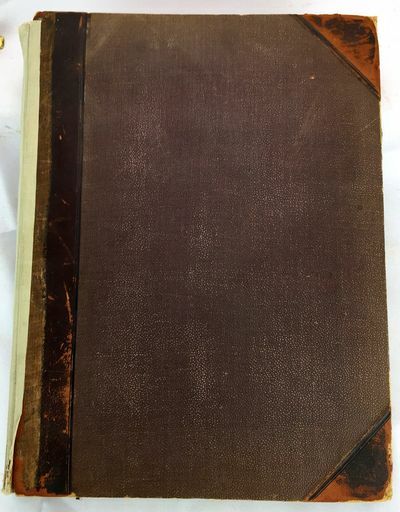 $3000.First edition of Mary ShelleyÂ’s important edition of her husbandÂ’s poetical works, in scarce original cloth.After Percy Shelley's death in 1822, Mary Shelley devoted herself to writing his biography and publishing his manuscripts. She first attempted to publish Shelley's poems in 1824, but his father, Sir Timothy Shelley, prevented further publication of Shelley's writings for 15 years. ""In 1839, the obstacles to an authentic edition having been removedÂ… Mrs. Shelley published what was then supposed to be a definitive edition in four volumes, enriched with biographical notes and some very beautiful lyrics which had remained in manuscript"" (DNB). With engraved frontispiece portrait of Shelley by Finden in Volume I. With publisher's advertisements in Volumes II and IV. Lowndes, 2374. Contemporary owner signature of Charles Williams Wynn, Jr., the 19th-century Welsh politician. His father was a close friend and patron of Robert Southey, who dedicated Madoc to him.Interior generally fine, original cloth with mild toning to spines. A lovely copy in near-fine condition. 1839. First Edition . Signed. (BRYANT-PIERCE, Maris) DELAFIELD Jr., John. An Inquiry into the Origin of the Antiquities of America. An Appendix, Containing Notes, and ""A View of the Causes of the Superiority of the Men of the Northern Over Those of the Southern Hemisphere."" New York: Colt, Burgess, 1839. Quarto, original gilt-stamped brown cloth rebacked in brown calf gilt, all edges gilt. 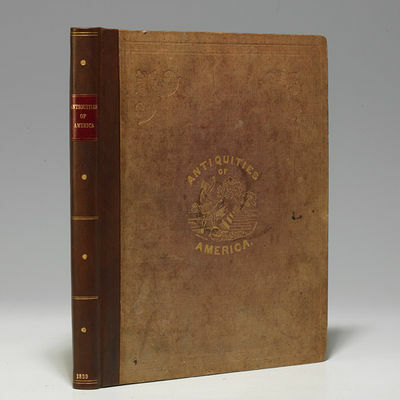 $3100.First edition of this 19th-century quasi-anthropological study of the origin of the American peoples, with 10 lithographic plates (five hand-colored) and 19-foot folding facsimile of the Codex Boturini, the copy of Native American activist and Seneca Nation leader Maris Bryant Pierce. Accompanied by an 1864 Civil War round-trip travel pass from the Washington D.C. military district to Alexandria bearing an oath of allegiance signed by Pierce.This work focuses on the origin of the American peoplesÂ—specifically an explanation of the different American racesÂ—and takes something of an anthropological approach. Delafield attempts a comparative analysis of different American and Asiatic dialects. He also analyzes the anatomical features of the people he chooses to study. Perhaps his most compelling work, from a modern perspective, is his attention to creation and deluge myths, an area of enduring interest. One of the most important features of this work is the 19-foot folding facsimile of the Codex Boturini, an illustrated depiction of the migration legend of the Aztec people (here present in a tipped-in pocket; originally attached as a frontispiece and ""often lacking"" (Howes D229)). According to the Codex, the Aztecs left their homeland Atzlán (""land or place of wings"" or ""land of herons"") in the present-day southwestern United States in 1 Tecpatl (1064 C.E.) and headed south to settle in Tenochtitlán in the Valley of Mexico in 1325 C.E. The illustrations show the Aztecs interacting with the goddess Chimalma in Aztlán, leaving by boat, and eventually meeting the god Huitzilopochtli in a cave. Footprints and scrolls show the intersection of man's journey and the instructions of the gods. In addition to the folding facsimile, this book also has 10 exceptional lithographic plates, five of which are hand-colored, depicting artifacts, skulls, traditional artwork, plans, and more. Howes D229. Sabin 19333. Field 509. This copy belonged to Seneca Nation leader Maris Bryant Pierce and bears his name (secretarial hand) on a front blank. Born and raised on reservations, Pierce converted to Christianity and was educated at Dartmouth through the Presbyterian Church. It was during his time at Dartmouth that he first became involved in activism, opposing Treaty of Buffalo Creek of 1838. The treaty, which some members were effectively coerced or manipulated into signing, sold remaining Seneca lands to the Ogden Land Company and relocated the tribe to Kansas. Pierce fiercely disagreed with the treaty and the methods used to secure it. He made speeches, wrote to Van Buren on behalf of the tribe, and hired legal counsel. In 1842, the treaty was negotiated. Ultimately, some lands were lost (including the reservation where Pierce spent much of his childhood and where he and his wife lived), but the tribe held onto three other reservations. Pierce went on to become secretary of the Seneca Nation and brought a system of elected government to the tribe. Additionally, this work has Pierce's 1864 Civil War Washington D.C. to Alexandria signed travel pass laid-in. It is partially printed and partially filled out in manuscript and reads: ""No. 738. Head Quarters Military District, Washington, D.C. May 2nd 1964. Pass the Bearer M.B. Pierce within the lines of the Fortifications to Alexandria and return, Reason: Business. This Pass will expire On Return Trip. By order of John H. Martindale, Brig. Gen. and Military Governor. JÂ—Â—. E. Montgomery. [Verso] To be signed before used. Age 48 Height 5-8 Complexion Dark Hair "" Eyes "" Oath of AllegianceÂ… Signed M.B. Pierce. ""Expert paper repairs to front blanks, preliminary leaves with expert cleaning, light foxing to interior including facsimile, a bit of soiling to cloth. A very good copy. Rare. 1839. First Edition . SHELLEY, Percy Bysshe. 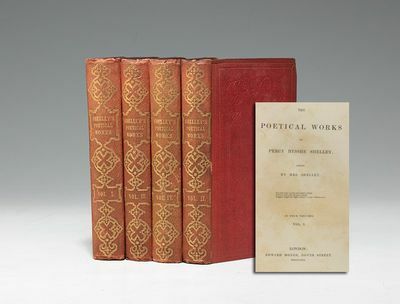 The Poetical Works of Percy Bysshe Shelley. Edited by Mrs. Shelley. London: Edward Moxon, 1839. Four volumes. 12mo, late 19th-century full red morocco, elaborately gilt-decorated spines, raised bands, marbled endpapers, top edges gilt. 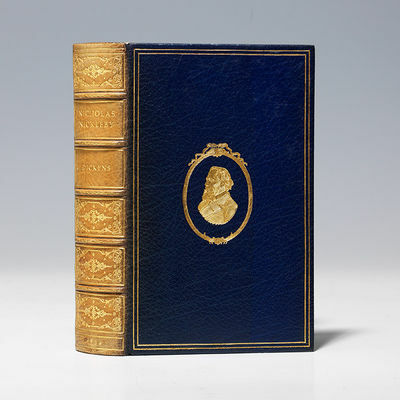 $2900.First edition of Mary ShelleyÂ’s important edition of her husbandÂ’s poetical works, with engraved frontispiece portrait of the poet by Finden, beautifully bound in full morocco gilt by Zaehnsdorf.After Percy Shelley's death in 1822, Mary Shelley devoted herself to writing his biography and publishing his manuscripts. She first attempted to publish Shelley's poems in 1824, but his father, Sir Timothy Shelley, prevented further publication of Shelley's writings for 15 years. ""In 1839, the obstacles to an authentic edition having been removedÂ… Mrs. Shelley published what was then supposed to be a definitive edition in four volumes, enriched with biographical notes and some very beautiful lyrics which had remained in manuscript"" (DNB). Lowndes, 2374. 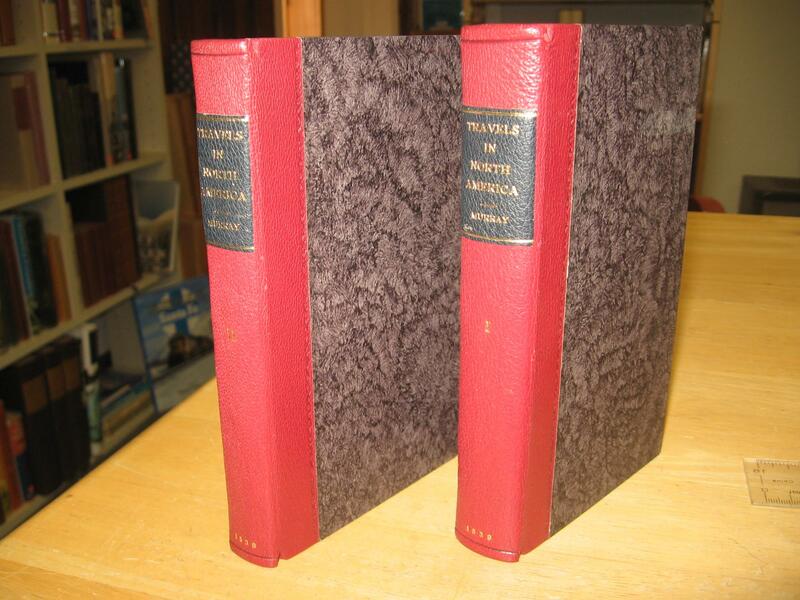 A beautifully bound set in fine condition. 1839. First Edition . DICKENS, Charles. The Life and Adventures of Nicholas Nickleby. 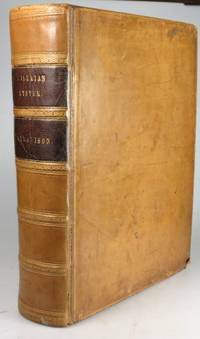 London: Chapman and Hall, 1839. Octavo, early 20th-century full dark blue morocco, elaborately gilt-decorated spine and covers, raised bands, marbled endpapers, all edges gilt. Housed in a custom cloth slipcase. 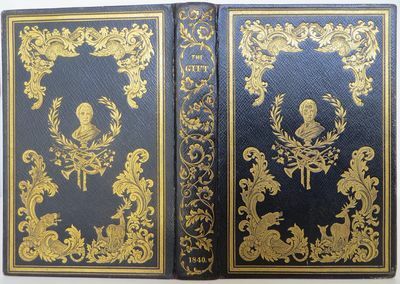 $2600.First edition in book form, bound from early parts, of one of DickensÂ’ most popular novels, illustrated with 39 etchings by Hablot Knight Browne (Â“PhizÂ”) and the steel-engraved frontispiece portrait after the painting by David Maclise, extra-illustrated with 35 engraved plates depicting scenes and characters from the text and handsomely bound by Bayntun (Riviere) in full morocco-gilt with a gilt portrait of Dickens on the front board.The plot, the characters, the dialogue, everything about the book ""has the feel of theatre; it is as if Dickens saw human life conducted among lights of the stage, making it somehow larger and brighter than the reality"" (Ackroyd, 283). This copy is bound from a mix of early and later parts, with ""visiter"" corrected to ""sister"" on page 123 (a later state) and ""latter"" on page 160 (an earlier state). First state of the engraved frontispiece portrait of Dickens (with Chapman &amp; Hall imprint at bottom) and first states of plates one, two, and three (with Chapman &amp; Hall imprint at bottom). Originally issued in 20 parts from April 1838 to October 1839. Extra-illustrated with 35 engraved plates from an early edition of Nicholas Nickleby printed by Grattan &amp; Gilbert. Bound with half title. Eckel, 64-66. Smith I:5. Gimbel A41. A few expert marginal paper repairs, occasional faint foxing and soiling to plates and text, spine toned to tan. A near-fine copy, handsomely bound. The experiences of his five years in the Beagle, how he dealt with them, and what they led to, built up into a process of epoch-making importance in the history of thought"" (DSB). Darwin's Journal, ""his first published book, is undoubtedly the most often read and stands second only to On the Origin of Species as the most often printed"" (Freeman, 31). It is ""one of the most interesting records of natural history exploration ever written and is one of the most important, for it was on this voyage that Darwin prepared for his lifework, ultimately leading to The Origin of Species"" (Hill I:104-05). Volume I contains Captain King's account of the first expedition, which surveyed the coasts of Patagonia and Tierra del Fuego; Volume II, with its appendix volume, is Captain Fitzroy's account of the second voyage of the Beagle. Complete with 44 plates, four inserted charts and maps, and eight folding maps. (Folding charts and maps, originally issued loose, have been bound into their respective volumes, at the rear.) 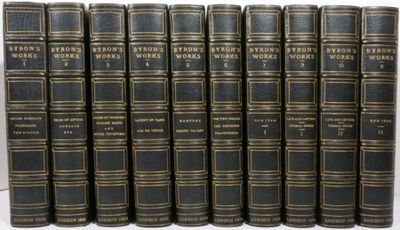 Bound with half titles, except for Appendix to Volume II. Bound without publisher's advertisements at rear of Appendix volume. Freeman 10. Norman 584. Hill I:104-05. Sabin 37826. Faint evidence of inkstamps on title pages.Text and plates generally clean, folding maps in excellent condition, with only the occasional short split or bit of archival reinforcement to verso. Period-style bindings handsome and fine. A most desirable about-fine copy. Paris: Alphonse Giroux et Cie, Editeurs, 1839. The First Edition with the portrait of Daguerre and with the additional seventh figure on plate 1, this rare edition is one of the first printings of the groundbreaking work. With the lithographed portrait of the author and 6 engraved plates, numbered I-VI. 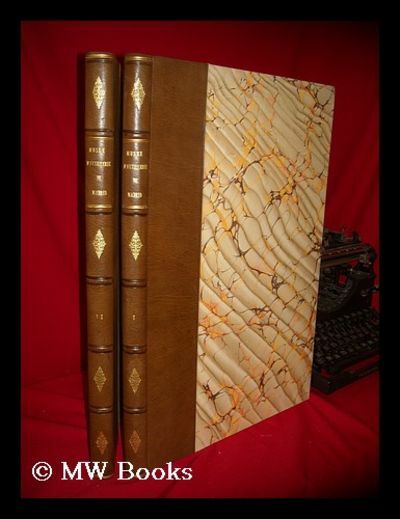 8vo, in an attractive antique binding of half tan calf over marbled boards, the spine lettered in gilt between flat bands, marbled endpapers and additional blanks, t.e.g. With half-title, portrait, title, and 76 pp. A very fine and handsome copy, the text especially clean and fresh, beautifully preserved, the binding attractive and tight. RARE. ONE OF THE FIRST PRINTINGS OF THIS LANDMARK WORK. FIRST EDITION WITH THE PORTRAIT OF DAGURRE AND THE FIRST EDITION TO INCLUDE THE SEVENTH FIGURE TO PLATE 1. “Daguerre’s exposition of his photographic process. Daguerre, a gifted set designer and creator of the famous Diorama, a picture show based on lighting effects, began experimenting in the 1820’s with fixing the images of the camera obscura on silver chloride paper. His continued lack of success using this method stimulated his interest in the heliographic method invented by Nicéphor Niépce, who had produced the first successful photographic image in 1826 or 1827 on a pewter plate coated with bbitumen of Judea dissolved in oil of lavender, and in 1829 Daguerre succeeded in persuading the reluctant Niépce to become his partner. It was only after Niépce’s death, however, in the spring of 1835, that Daguerre accidentally discovered a quicker method of exposing and developing the Niépcian image through the application of mercury vapor. Using this method, with common table salt as the fixative, he produced his first successful permanent photographic image in 1837.” ‘In 1839, the discovery was given official status by a brief announcement at the Académie des Sciences. In the late summer, a full announcement was made to a packed house at a joint meeting of the Académies des Sciences and des Beaux-Arts at the Institut de France. The excitement was palpable. “Perhaps no other invention ever captured the imagination of the public to such a degree and conquered the world with such lightening rapidity as the daguerreotype”. Daguerre’s manual, published by order of the government, was quickly sold out. A total of 39 reprints, new editions and translations appeared in the following 18 months. The great demand accounts for the profusion of issues of the first edition: 7 are recorded, all from the basic setting of type. The first issue to appear was the Alphonse Giroux issue of which only 3 copies are known to survive.’ The copy here offered is also printed by Giroux and is the first to appear with the seventh figure. “Along with the official documents relating to the government’s review of the procedure, Daguerre’s manual includes details of its genesis, including a transcription of Niépce’s own description of his heliographic process, submitted to Daguerre in 1839, and a full illustrated description of his daguerreotype process---presented as an independent invention... . In the public imagination, Daguerre competed only with Fox Talbot for the title of inventor of photography....” Norman 569. [Daguerre, Louis Jacques Mandé; Photography; Daguerreotype]; Arago François; Duvernoy, M. et al. Paris: Bachelier, Imprimeur-Libraire, Various dates, August - December 1839. FIRST EDITION OF THE VERY RARE FIRST ANNOUNCEMENT OF DAGUERRE'S GROUNDBREAKING WORK IN PHOTOGRAPHY. A COLLECTION OF IMPORTANT ACADEMIE DES SCIENCES PRINTINGS ON DAGUERRE AND PHOTOGRAPHY and ADDITIONALLY WITH, the first descriptions of the process and with letters and articles on the work of Daguerre, Niepce and others. 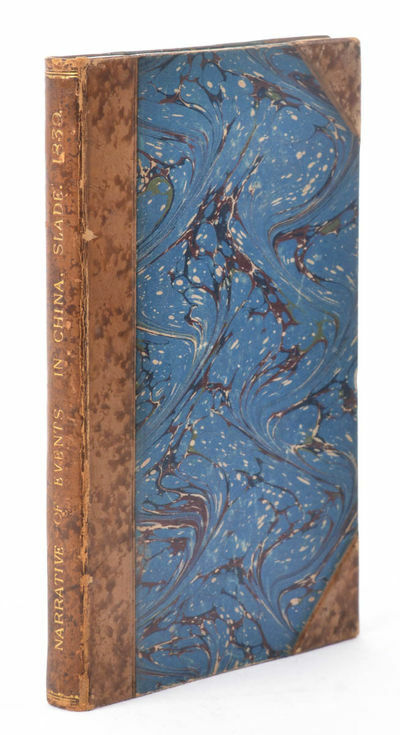 4to, in a French binding of fine crushed navy-blue morocco over sympathetically coloured fine marbled boards, the spine gilt ruled, lettered and with decorations, marbled endpapers. half-title; 227-228; 249-268; 289-290; 353; 376-380; 455-458; 411-412; 423-432; 485-486; 511-514; 539-540; 553-554; 559-560; 595-596; 713-714; 771-772; 801-802; 823-824 Beautifully preserved oriignal extracts relating to the discovery of the Daguerréotype handsomely bound together. FIRST EDITION OF THE VERY RARE FIRST ANNOUNCEMENT OF DAGUERRE'S GROUNDBREAKING WORK IN PHOTOGRAPHY. RARE ARTICLES FROM L’ACADÉMIE DES SCIENCES RELATING TO THE DAGUERRE AND THE DAGUERREOTYPE AND EARLY PHOTOGRAPHY. The first announcements of Daguerre’s groundbreaking work in photography and other important letters and articles on the discovery. “Daguerre’s exposition of his photographic process. Daguerre, a gifted set designer and creator of the famous Diorama, a picture show based on lighting effects, began experimenting in the 1820’s with fixing the images of the camera obscura on silver chloride paper. His continued lack of success using this method stimulated his interest in the heliographic method invented by Nicéphor Niépce, who had produced the first successful photographic image in 1826 or 1827 on a pewter plate coated with bitumen of Judea dissolved in oil of lavender, and in 1829 Daguerre succeeded in persuading the reluctant Niépce to become his partner. It was only after Niépce’s death, however, in the spring of 1835, that Daguerre accidentally discovered a quicker method of exposing and developing the Niépcian image through the application of mercury vapor. Using this method, with common table salt as the fixative, he produced his first successful permanent photographic image in 1837.” ‘In 1839, the discovery was given official status by a brief announcement at the Académie des Sciences. In the late summer, a full announcement was made to a packed house at a joint meeting of the Académies des Sciences and des Beaux-Arts at the Institut de France. The excitement was palpable. “Perhaps no other invention ever captured the imagination of the public to such a degree and conquered the world with such lightening rapidity as the daguerreotype”. Daguerre’s manual, published by order of the government, was quickly sold out. A total of 39 reprints, new editions and translations appeared in the following 18 months. The great demand accounts for the profusion of issues of the first edition: 7 are recorded, all from the basic setting of type. The first issue to appear was the Alphonse Giroux issue of which only 3 copies are known to survive.’ “Along with the official documents relating to the government’s review of the procedure, Daguerre’s manual includes details of its genesis, including a transcription of Niépce’s own description of his heliographic process, submitted to Daguerre in 1839, and a full illustrated description of his daguerreotype process---presented as an independent invention... . In the public imagination, Daguerre competed only with Fox Talbot for the title of inventor of photography....” Norman 569. 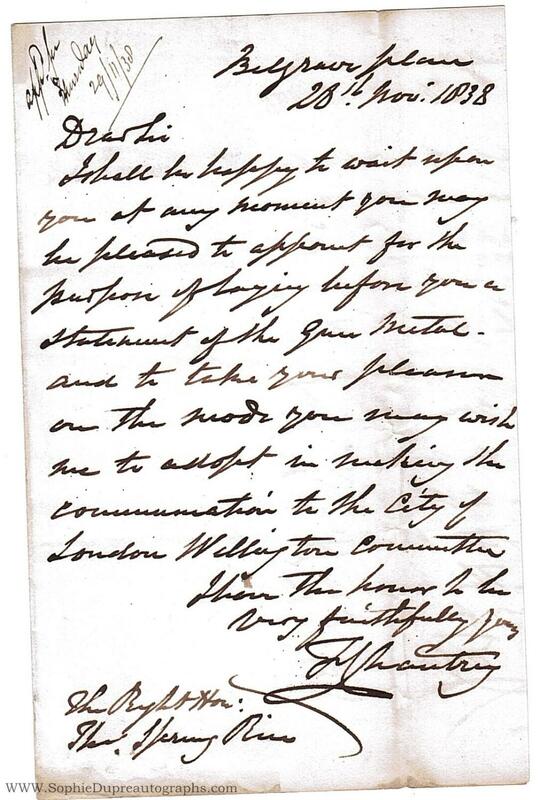 1839 - (1790-1866, Chancellor of the Exchequer, 1835-1839, from 1839 1st Baron Monteagle), saying he "shall be happy to wait upon you" with "a statement of the Gun Metal" and to ask how he may reply "to the City of London Wellington Committee" (28th November 1838, endorsed "C of E saw party 29/11/38"), in the second he explains that he "refrained from acknowledging the donation of fifteen hundred & twenty pounds worth of Gun Metal for the City of London Wellington Statue" till he had met and told "the acting committee . not only the amount of the gift, but the very ready and handsome manner in which it had been made", at "the Mansion House yesterday . all were at a loss in what manner it would be most agreeable to you they should reply to the generosity of the Government", so Chantrey is asking whether a letter of thanks to Spring Rice as Chancellor of the Exchequer "would be a fitting manner of acknowledging . the substantial way in which their efforts have been assisted by Her Majesty's Ministers", 1 side 8vo and 1 side 4to, Belgrave Place & Eccleston Street, London, 28th November - 26th January The gun metal was from cannon captured during Wellington's victories, in particular Waterloo. The equestrian statue, with its fine modelling of the Duke's face and of his charger 'Copenhagen', was planned for 18th June 1843, but unveiled a year later on what is now the forecourt of the Royal Exchange. Several buildings including the Sun Office were removed as part of the improvements. Chantrey was selected by a small majority, it is believed, over Matthew Cotes Wyatt. Subscriptions from Wyatt's supporters continued and in 1846 his colossal statue, 30 feet tall, was placed on the arch at Hyde Park Corner, but, being out of proportion, was removed in 1885 to Aldershot. (The present statue at Hyde Park Corner is by Sir Edgar Boehm, 1888). See The Times for 25th February 1839, and, for an interesting letter comparing the cost of the two projects, 15th June 1843. A New Dictionary of the English Language. London: William Pickering, 1839. 2 volumes; 4to. Contemporary full diced calf boards with gilt rule, recent respine in plain calf with gilt titles. Light foxing; corners repaired. Sound. London : Henry G. Bohn, 1839-01-01. Hardcover. Good. Vol. 1 only. 39 cm. 2nd ed. Folio. Backed on 3/4 cloth. Hardcover. Good binding and cover. Hardcover. Library stamps and markings. Vol. I : , xxvi, 67,  p.,  etch. pl. (2 fold.). Bohn bought the copperplates for this second edition from Cotman in 1836, together with those that appeared in Specimens of architectural remains, for an average price of 5 shillings apiece (Kitson, Cotman, pp. 182, 323-4). This is an oversized or heavy book, that requires additional postage for international delivery outside the US. London: John Murray, 1839. (The Letters and Journals in first edition). Minimal occasional foxing, fine. Lovely wide-margined copies. (The Letters and Journals in first edition). Together ten volumes. Quarto. Illustrated with 136 engraved plates by Finden (including one not listed in the directions to the binder) and extra-illustrated with 99 engraved portraits and scenes with a mounted signature of Byron and two autograph letters signed by Byron, each on a folded sheet, one in English, the other in French. 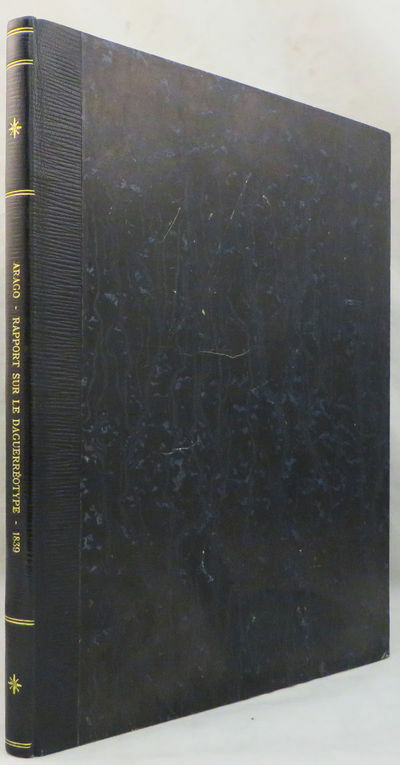 Bound in half dark blue crushed morocco with cloth sides and marbled endpapers, t.e.g., the spines with gilt titles and simple double fillet frames in the panels. The note below the mounted signature reads: "Auto of Lord Byron - Given to me by Mrs. Payne, late Miss Pigot, niece & executrix of 'Bridget Pigot' who was such an intimate friend of Lord B. who supplied so many letters to Moore for Lord B's Life." With the bookplates of Elmer Holmes Bobst (1884-1978) American businessman and philanthropist. Bertolotti Gaetano dis. - Carlo Sciolli lit. & Doyen imp. CUCINA TEORICO PRATICA COL CORRISPONDENTE RIPOSTO ED APPARECCHIO DI PRANZI E CENE CON QUATTRO ANALOGHI DISEGNI. 1839. Metodo pratico per scalcare, e far servire in tavola. Lista di quattro piatti al giorno per un anno intero. E finalmente una cucina casareccia in dialetto napoletano con altra lista analoga. Composta dal Signor Ippolito Cavalcanti, Duca di Buonvicino. Seconda edizione. Napoli, dalla tipografia di G. Palma, 1839. In 8°, pp. VIII (frontespizio, dedicatoria, prefazione al lettore); 440 n. Esemplare corredato da 4 splendide tavole di grandi dimensioni, piu volte ripiegate e allegate alla fine del testo. Legatura coeva in piena pergamena bruna, dorso con ricchi fregi e titoli in oro. Esemplare solido e egregiamente conservato. Il trattato Cucina teorico-pratica, pubblicato per la prima volta a Napoli nel 1837 alla quale aggiunge, nella seconda edizione del 1839, l'appendice Cusina casarinola co la lengua napolitana, presenta numerose ricette dell'epoca, provenienti dalle diverse classi sociali. Il libro ebbe, dal 1837 al 1865 nove edizioni, abbastanza diverse fra di loro in quanto venivano continuamente ampliate dall'autore. La Cucina teorico-pratica è un compendio di cucina tradizionale napoletana, alcune delle ricette sono di ispirazione francese, in quanto la cucina d'Oltralpe era all'epoca molto presente sulle mense dell'aristocrazia o dell'alta borghesia, l'appendice ci riporta invece alla cucina casereccia in uso all'epoca presso il popolo. Paris : Au Bureau Des Anciennes Tapisseries Historiees, (1839? ), 1839. First Edition. Minor scattered marginal foxing. Impressively bound in modern aniline calf over marble boards. Raised bands with gilt-blocked title and volume indications. Spine compartments uniformly tooled in gilt. An exceptional set - scans and additional bibliographic detail on request. ; 1 pages; Physical desc. : 2 v. , plates colated and all present ; 51 cm. Subject: Real Armeria de Madrid. Weapons & Armor - Spain - Madrid - Early illustrated works. Complete in 2 volumes - later editions offered a 3rd supplementary volume. Language: French. (Ottawa): House of Commons, 1839. First Edition. Paper wraps. Very Good. 171 p. plus 34 p. appendix. 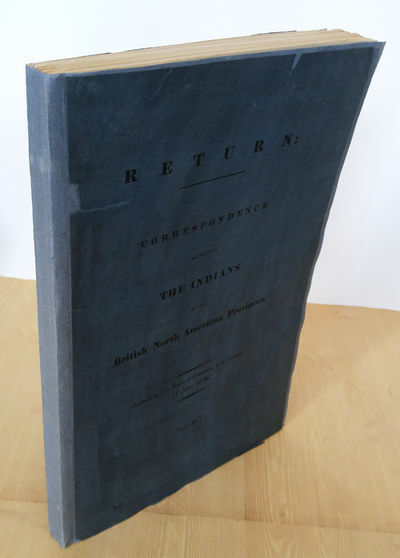 Rebound incorporating original blue paper covers. Fore-edges a little rough. Some tears in bottom of title page. This collection of correspondence from individuals including Lord Glenelg, Earl of Gosford, Sir Francis Bond Head, Sir G. A. Arthur, Sir J. Colborne, Sir C. A. Fitz Roy, Native Councils and others. Issues discussed in the correspondence largely revolve around land, religion, education, and agriculture. The Appendix is a report on seigniorial tenure resolutions passed in 1850, likely added to the book upon rebinding. Den Gründern der Fürstenwarte. Panorama am Plavutsch [sic] nächst Grätz" [Deckeltitel]. 1839. German, 1839. Original colour lithograph depicting a playful and satirical approach of a painter to his work. 47 x 38,5 cm. Excellent condition of this early lithograph - in old, original hand-colouring. Wonderful example of a very accomplished work using the still young technique of lithography. Playing with all sorts of clichées of artists and their approaches, centering the pastime of the usuccessful artist against the seriousness of the craft. The year 1683 on the easel surely a clue to deciphering the meaning of this image, we were not able to do so. Whoever solves the puzzle, receives 20% discount on the price of this artwork. Narrative of the Surveying Voyages of His Majesty's Ships Adventure and Beagle, between the Years 1826 and 1836, describing their Examination of the Southern Shores of South America, and the Beagle's Circumnavigation of the Globe. 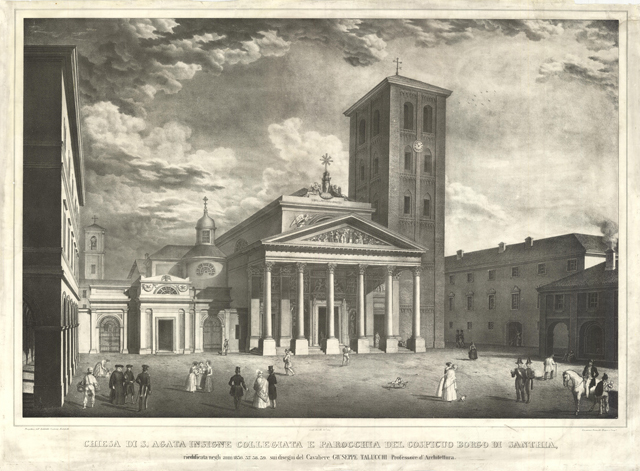 London: Henry Colburn, 1839. First edition, an extraordinary presentation copy connecting two exceptional Victorians, inscribed by the Commander of the Beagle Robert FitzRoy (see below), the man who chose Darwin to accompany him on the epochal voyage. "The voyage of the Beagle has been by far the most important event in my life, and has determined my whole career" (Charles Darwin, Life and Letters I, p. 61). "The five years of the voyage were the most important event in Darwin's intellectual life and in the history of biological science. Darwin sailed with no formal scientific training. He returned a hard-headed man of science, knowing the importance of evidence, almost convinced that species had not always been as they were since the creation but had undergone change ... The experiences of his five years in the Beagle, how he dealt with them, and what they led to, built up into a process of epoch-making importance in the history of thought" (DSB). The third volume comprises Darwin's own journal of his voyage in the Beagle, which is the first issue of his first published book. It is "is undoubtedly the most often read and stands second only to On the Origin of Species as the most often printed" (Freeman, 31). It is "one of the most interesting records of natural history exploration ever written and is one of the most important, for it was on this voyage that Darwin prepared for his lifework, ultimately leading to The Origin of Species" (Hill I: 104-105). Volume I of the Narrative concerns the initial surveying expedition, 1826-30, under Philip Parker King in the Adventure, during which FitzRoy succeeded Pringle Stokes as commander of the accompanying Beagle. Volume II describes FitzRoy's continuation and completion of the survey with the Beagle alone, ending in 1836. 'The surveys he carried out in South American waters established FitzRoy as a first-rate hydrographer and won for him the gold medal of the Royal Geographical Society (1837). Because his marine surveys were accurate to such a high degree they are still used as the foundation for a number of charts of that area' (DSB). 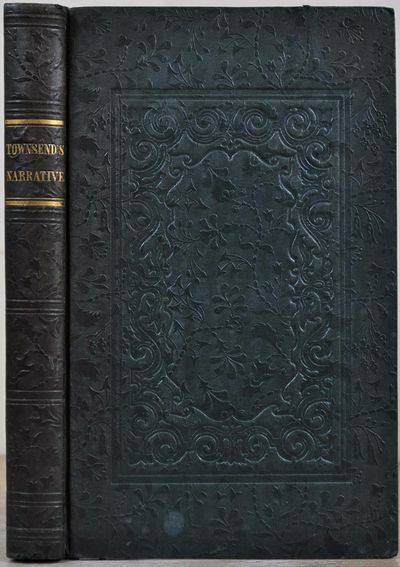 Only one other complete copy of the Narrative in its original binding and inscribed by FitzRoy has appeared at auction (Christie's South Kensington, September 21, 2005, lot 79, £33,600 = $60,752). A copy inscribed by FitzRoy but lacking one of the plates sold for £42,049 ($63,885) at Bonham's, June 19, 2013, lot 43. Provenance: inscribed and signed on the half-title by the Captain of the Beagle, Robert FitzRoy, to 'Dr. Lee, LL.D., a tribute of esteem and respect from Robt. FitzRoy, Sept. 19th, 1856.' Also inscribed by Lee on the front pastedown, 'John Lee, Hartwell, a present from the accomplished author, 22 September 1856', with Lee's armorial bookplate on front pastedown in all volumes. John Lee (1783-1866) was an English philanthropist, astronomer, mathematician, antiquarian and barrister. 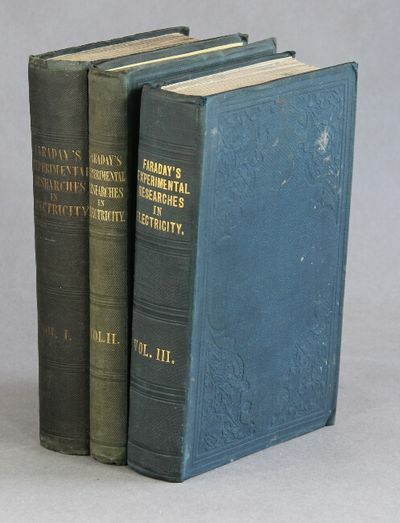 Lee and FitzRoy were both pioneer meteorologists, and this is probably the reason for the gift of these volumes: Lee was a founder of the British Meteorological Society in 1839, and FitzRoy was instrumental in the founding in 1854 of the Meteorological Office of the Board of Trade, and was its first head. FitzRoy issued the first daily weather forecasts, published in The Times, and actually invented the term 'weather forecast'. "If it had not been for Robert FitzRoy, the name Charles Darwin would now be remembered, if at all, as that of a country parson with an interest in natural history, perhaps rather in the mould of Gilbert White, of Selborne. The theory of natural selection, which explains the fact of evolution, would be known from the work of Alfred Russel Wallace, who came up with the idea independently of Darwin, and whose work prompted Darwin to go public with his own ideas; we would be as familiar then with the term 'Wallacian evolution' as we are, in the real world where Robert FitzRoy lived, with the term 'Darwinian evolution'. In that real world, FitzRoy is known, so far as he is widely known at all, as Darwin's Captain on the voyage of HMS Beagle during which the young naturalist made the observations which pro- vided the inspiration for the further years of hard work on which his theory would be based. But if Charles Darwin had never lived, the name of Robert FitzRoy might be widely held in higher esteem than it is in our world, where it has remained forever in the shadow of Darwin" (Gribbin, FitzRoy, p. 11). "Anxious that no opportunity of collecting useful information, during the voyage, should be lost; I proposed to the Hydrographer [i.e., Francis Beaufort, Hydrographer to the British Admiralty] that some well-educated and scientific person should be sought for who would willingly share such accommodations as I had to offer, in order to profit by the opportunity of visiting distant countries yet little known. Captain Beaufort approved of the suggestion, and wrote to Professor Peacock, of Cambridge, who consulted with a friend, Professor Henslow [Darwin's former mentor and teacher], and he named Mr. Charles Darwin, grandson of Dr. Darwin the poet, as a young man of promising ability, extremely fond of geology, and indeed all branches of natural history. In consequence an offer was made to Mr. Darwin to be my guest on board, which he accepted conditionally; permission was obtained for his embarkation, and an order given by the Admiralty that he should be borne on the ship's books for provisions. The conditions asked by Mr. Darwin were, that he should be at liberty to leave the Beagle and retire from the Expedition when he thought proper, and that he should pay a fair share of the expenses of my table" (Vol. II, pp. 18-19). Volume II is FitzRoy's account of the expedition's second voyage during the years 1831-1836, when the Beagle explored Tierra del Fuego at the southern tip of South America and the west coast of the continent. The ship then traveled to the Enchanted Islands, better known now as the Galapagos Islands. From there, the Beagle sailed to Tahiti, New Zealand, Australia, around the Cape of Good Hope, St. Helena, Ascension Island, Bahia, Cape Verde Islands and the Azores, and then home to England. FitzRoy not only captained the Beagle, but also served as the ship's hydrographic surveyor, meteorologist, and amateur naturalist. "FitzRoy, who was more concerned with science than were many naval officers of his day, made it possible for Darwin to visit tropical lands and study their flora, fauna, and geology. The two men shared the same cabin and FitzRoy was attentive to the scientific needs and interests of the young Darwin. FitzRoy's violent temper and his conservative opinions on religion and slavery were responsible for some disagreements between them, but FitzRoy and Darwin remained on friendly terms ... While Darwin made his observations in South America and collected his specimens, FitzRoy surveyed the southern coast of that continent. The years of the second Beagle voyage marked the beginning of a half-century of supremacy of British hydrography" (DSB). Many years later Darwin reflected in his autobiography that FitzRoy's character "was in several respects one of the most noble which I have ever known." "FitzRoy's duty in the years immediately following the return of the Beagle to England was clear. His first priority was to complete the preparation of the mass of charts, sailing directions, and other technical material resulting from the voyage, and he continued to receive his pay for carrying out this work even after the Beagle was paid off ... work on this material continued long after the pay for it stopped, and that the last instalment was sent back to Beaufort by FitzRoy on his arrival in New Zealand in September 1844, having presumably been completed on the voyage out from England. But there was also considerable public interest in the activities of the Beagle, and FitzRoy also felt it his duty to write up the material from both voyages into a book. With his predecessor, Pringle Stokes, dead, and with Captain King having retired to Australia, FitzRoy carried the responsibility (as he saw it) for all the material from the first voyage, as well as his own narrative of the second voyage. It soon became clear that with all this, and Darwin's material as well, there was far too much for one volume. We do not have the details of the discussions that must have taken place, but it is clear that Darwin and FitzRoy soon reached an amicable agreement (by January 1837) that FitzRoy would use the material he was responsible for to prepare two volumes, one covering the first voyage (Beagle and Adventure) and the other the second, while Darwin would write his own account of the second voyage for a third volume to be published with the other two as a single book. "As the work progressed, FitzRoy found that the only way to cope with the mass of technical material and his own observations on various topics (such as the Fuegian language) that would otherwise break up the flow of the narrative was to relegate the material to a fourth volume of Appendices. Altogether he would produce well over half a million words, all written out by hand" (Gribbin, FitzRoy, pp. 175-6). Publication of Darwin's journal, which contained a history of the voyage and a sketch of observations in natural history and geology, had been urged by FitzRoy during the voyage. It "was ready much earlier than the rest. The manuscript of the main text was finished by June 1837, and it, with the index, was in print early in 1838. The preface was written later and in it he states that 'publication has been unavoidably delayed' ... The printing of the preliminaries and the appendix probably took place before January 24 1839. On that day he was elected a Fellow of the Royal Society, but the initials do not appear on the title page of Volume III. 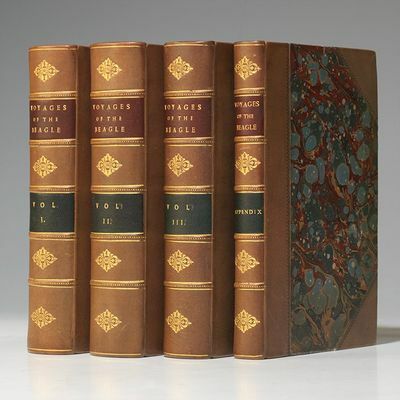 Immediately popular, it was reprinted separately later in the same year, and in numerous later editions with different titles, but is widely known today as The Voyage of the Beagle. It was one of Darwin's personal favourites, as he writes in his autobiography: "The success of this my first literary child tickles my vanity more than that of any of my other books." "Ever since his Beagle days FitzRoy had shown an interest in the study of the weather. Therefore, when the British government created (1855) the Meteorologic Office, instructed to gather weather information for shipping, it was not surprising that the Royal Society should ask FitzRoy be placed in charge of it ... While a committee of the Royal Society deliberated about the exact nature of the work to be done by the Meteorologic Office, FitzRoy contacted the ship captains who would make meteorological observations for him. He was not satisfied merely to amass weather information; he wanted to warn sailors and others of approaching weather changes" (DSB). 1839. Paris, Carilian-Goeury et Vr Dalmont, libraires des Corps Royaux des Ponts et Chaussées et des Mines 1839. Sous-titre : Histoire de sa translation a Paris, description des travaux auxquels il a donné lieu, avec un appendice sur les calculs des appareils d'abattage, d'embarquement, de halage et d'érection. Détails pris sur les lieux, et relatifs au sol, aux sciences, aux moeurs et aux usages de l'Egypte ancienne et moderne suivi d'un Extrait de l'ouvrage de Fontana sur la translation de l'obélisque du Vatican. In-folio cartonnage vert éditeur. 215 pages + 15 planches doubles montées sur onglets, certaines dépliantes, imprimées par Lemercier, Bernard et Cie. Quelques rousseurs en page de titre et éparses sur quelques planches, cartonnage un peu frotté, coins émoussés. Malgré les petits défauts ici signalés, bel ouvrage, en édition originale très rare relatant cette monumentale entreprise que fut le transfert de l'obélisque d'Egypte à Paris, place de la Concorde, et pour laquelle un bateau, le Louxor, fut construit spécialement. Le monument fut érigé, à la place qu'il occupe toujours, en octobre 1836. Apollinaire Lebas fut en charge de cette entreprise que l'on peut qualifier, pour l'époque, de pharaonique. Cet ouvrage en est le récit tant historique que scientifique et technique. L'Obélisque avait été offerte à la France par Méhémet-Ali, Vice Roi d'Egypte en signe de la bonne entente entre les deux pays. Kronik der Kinder der Preussen und der Kinder der Holländer. Beschrieben in biblischer Sprache. "Utrecht" [= Altona? ], 1788. 8vo. With engraved frontispiece, titled: "Es lebe Oranien", woodcut vignette on title-page and at the end, and a woodcut headpiece. Contemporary paper wrappers. - Bilderdijk, Geschiedenis des Vaderlands XXII (1839), p. 208 ("zeldzaam"); GVK (2 copies); Picarta (3 copies); STCN (2 copies). 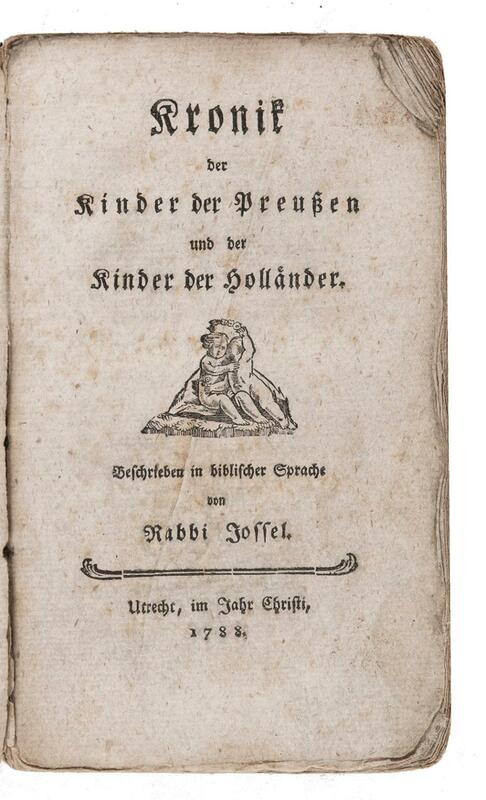 Curious German-language chronicle of Dutch history, probably published under pseudonym. It relates in a sort of biblical language the history of the Dutch Patriot Movement, especially in Utrecht, and the intervention by the Prussians in support of the party of the Orangists, preceded by a short survey of the history of the Dutch Stadtholders, the Princes of Orange, since the rebellion against Spain. The author seems to be in favour of the Orangist party, as the title of the frontispiece "Long live Orange" also suggests. This engraving shows soldiers on horseback fighting, while in the background a fortified city is being bombarded from across the river.Wrappers worn, tattered spine. Text foxed and slightly dog-eared. Untrimmed copy of a rare work on the Dutch Patriot Movement. L'art de créer les jardins, contenant les préceptes généraux de cet art; leur application développée sur des vues perspectives, coupes et élévations, par des exemples choisis dans les jardins les plus célèbres de France et d'Angleterre, et le tracé pratique de toute espèce de jardins. Nouvelle édition. Paris, Roret, 1839. ____ Edition illustrée de 24 lithographies en couleurs dont 5 planches sont à système : elles sont munies d'une partie mobile qui permet de voir les modifications projetées. (Une planche en porte en deux). L'illustration contient 6 plans de jardins sur double page et 18 vues de jardins. Sont représentés les jardins de Blenheim, Morfontaine, Chatsworth, Ermenonville, Stowe, Richemond, Windsor, Saint-Leu, Beauregard, Palais Pitti de FlorenceMarly-le-Roi, Longleat, Bougival, Wilton, etc. De légères rousseurs, quelques déchirures réparées sommairement sur les bords d'une grande planche dépliante, dos frotté, mais bon exemplaire de ce livre rare en couleur. Brunet V, 1138.*****. In-folio. Collation : (4), 106 pp., 24 planches h.-t. Demi-basane rouge à coins, dos orné en long. (Reliure de l'époque.). Narrative of the Late Proceedings and Events in China. Canton. 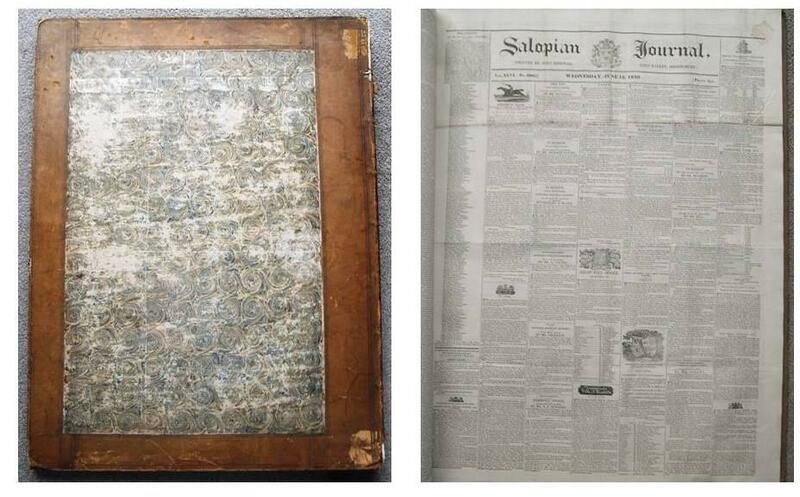 : Printed at the Canton Register Press.. 1839.. vi + 2 + 3a - 3f + 3 - 182pp +  + appendix 75 pp. Short closed tear upper margin title page, some foxing and browning endpapers and title page, very occasional spotting but in general the text is very clean. Two contemporary signatures upper margin title page a little trimmed. Half morocco a little worn at extremities, marbled paper covered boards. 19.5 x 13cm. Lust 577. Cordier 2360. John Slade the printer at the Canton Register published a great number of the documents, letters and opinions contained within these pages in the lead up to the First Opium War. As he did so it occurred to him "how useful a preliminary study for those of his distant fellow-countrymen interested in the late events" would be. This resulting work uses a great many source documents to explain the situation as he saw it between the key players - British and Chinese at the time. John Lust succinctly describes "Narrative of the Late Proceedings and Events in China" in his very useful bibliography "Western Books on China Published up to 1850" as "Largely a documentary commentary on Lin Tse-hsu's [Lin Zexu] anti-opium campaign and foreign reactions. Question of British rights not Chinese ethics". The 75 page appendix which John Slade recommends reading first, comprises Chinese documents, translated by largely Mr J. Robert Morrison, with others by Mr Thom, Mr Samuel Fearon and himself. Reading the Chinese viewpoint first John Slade believed would enable "his distant fellow country-men to approach the question of the trade in opium, with considerable knowledge of the tactics of the Chinese government as applied to it..." Rare. .
Carey abd Hart, 1839 First appearance of William Wilson, p. 229. Foxing to the engraved title and tissue guards. Binding detached as of p. 225. Some faint writing on front free end paper, name stamp on verso of front free end paper and other free end paper. - Sechter, Simon. Studien für Orgel oder Clavier. (collective title with central decorative vignette),  (blank), 3 (Beethoven song, with "Zur erinnerung an den schnellen unverhofften Tod unsers Krumpholz am 3. Mai 1817" to head and a printed note stating that the autograph of the song is in the collection of Aloys] Fuchs in Vienna at foot), 4-6 (Schubert song, with "Componirt in June 1816" to head of page 4), 7-8 (Weber VI Fugetten, with dedication to the composer's brother Edmund von Weber at head and "Der Bass ist offenbar falsch. Man lese wie in No. 3. R.S.," i.e. Robert Schumann, to foot), 9-11 (Sechter Studien, with "Contrapunctische Studien" at head of page 9) pp. Engraved throughout. Folio. Unbound. Slightly worn and soiled; central vertical crease; small oval embossed stamp "Kottenbach" to most leaves with small rectangular label to verso of title; identification in red ink to each piece. First Edition of the Beethoven song. Kinsky WoO104. Hoboken 3, 678. A separate issue in the series Sammlung von Musikstücken alter und neuer Zeit als Zulage zur neuen Zeitschrift für Musik, Heft VI, Juni 1839, published as a supplement to the Neue Zeitschrift für Musik edited by Robert Schumann. First Edition of the Schubert song. Deutsch 440. Les filles publiques de Paris et la police qui les régit, précédées d'une notice historique sur la prostitution chez les divers peuples de la terre. Paris, Leipzig, Desforges, 1839. ____ Première édition de ce tableau très circonstancié de la prostitution dans Paris par un ancien commissaire de police. "Il parut, il y a quelques temps, un ouvrage de M. Parent-Duchatelet, intitulé "De la prostitution dans la ville de Paris". L'ouvrage que nous publions doit être considéré comme son complément indispensable; fait par M. Béraud, ancien commissaire du bureau des moeurs, il contient des faits curieux et intéressants et des vues d'amélioration. (...) Le but principal de M. Béraud est l'abolition de la prostitution clandestine." Bel exemplaire. Ex-libris Jean de Montagliari. *****. 2 volumes in-12. Collation : VI, 4, CVIII, 260, (2) pp. / 327 pp. Demi-maroquin citron à coins, dos à nerfs, tête dorée. (Reliure de la fin du XIXe siècle). London: W. Ball & Co, 1839. 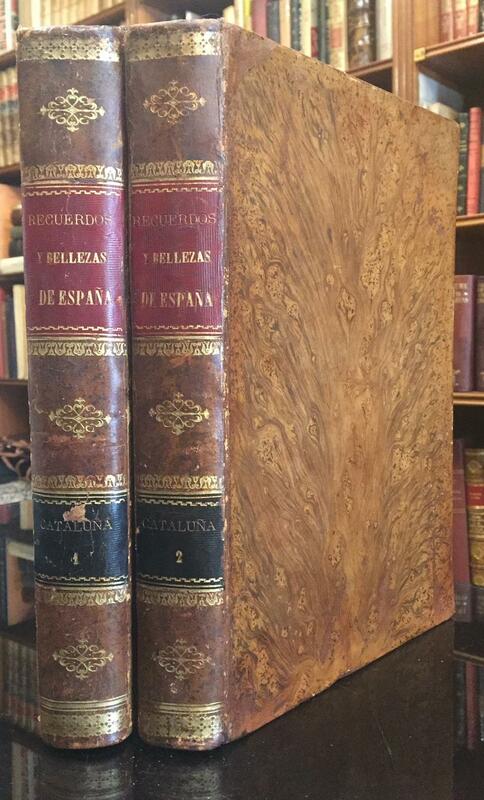 Three duodecimo volumes. viii, 43; xii, 70; (iv), 64 pp. With two sets of sixty playing cards designed to assist students in attaining proficiency in English grammar. The cards are on several colors of thick stock, and groups of them are imprinted with parts of speech. 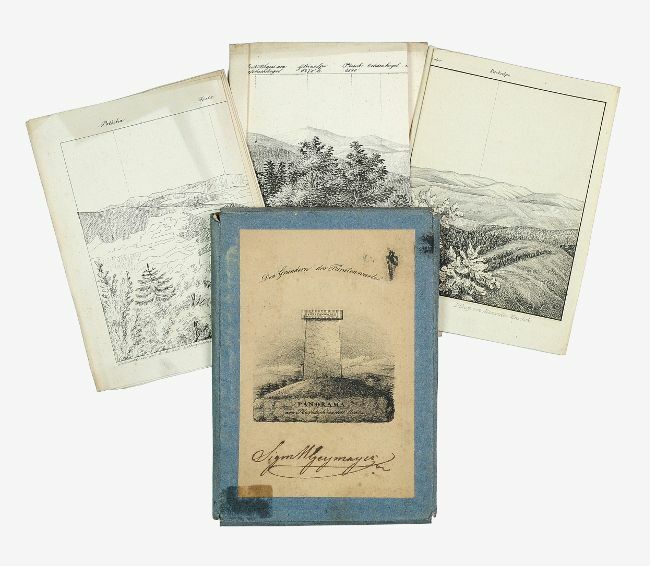 The three volumes contain the essential lessons in grammar (first volume); the text for the game, which is based on an abridgement of The History of Rome and various poetical extracts (second volume); and the key to the text volume for a scorekeeper to follow as needed (third volume). The second volume also provides the rules of the game, which can be played in a small group, or alone. A printed sheet, titled "Publisher's Preface" is also present, and serves as an advertisement for the game. The books are bound in a dark blue pebble-grain morocco stamped in blind and gilt, a.e.g. 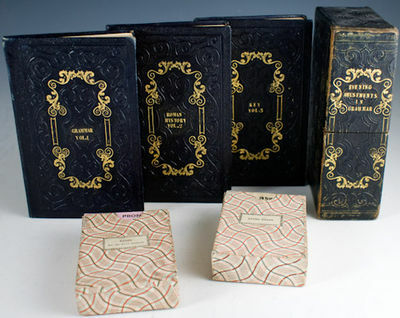 The cards are gilt-edged and housed in their original wavy-patterned paper slipcases. The whole is contained within a dark blue pebble-grain morocco pull-off case decorated in the same manner as the books. Rare: only three examples of this game are recorded, one of which is incomplete, and none are in the U.S. Apart from some minor rubbing and a small split to the pull-off case and short splits to edges of card cases, this is an exceptionally fine set. London: John Murray, 1839. First edition. Two parts in one volume. 4to. xxxii, 576; (575-59), 580-768 pp. Contemporary tan full calf, spine with raised bands, twin gilt lettered maroon labels, armorial bookplate to the front pastedown. 14 "lithographic sketches" - 12 full page and 2 folding of which 3 are coloured and another is tinted, plus 112 woodcuts in the text, 3 maps on 2 sheets, 31 plates of fossils (including 4 bis plates) and 9 coloured folding sections. Not including the large folding geological map on three sheets, included in the plate list but issued under separate cover and often wanting. Repair to the lower joint, some wear to the boards, occasional foxing to the plates, else very good. Donovan, p.117.